By LUDWIG VON KOOPA - GUILTY of lofty expectations. Ever since the Ace Attorney franchise failed to appear at E3 2018, despite our expectations, we've been looking for the 2018 Tokyo Game Show for CAPCOM to formally announce the next Ace Attorney game on Nintendo Switch. That Google-translates to, “We will deliver up-to-date information on ‘Ace Attorney’ series that fans can not miss!” In other words, unmissable news for Ace Attorney fans. Meaning that people who are already fans of the Ace Attorney series will be very interested in the announcement. Just to put it in context: The allegedly unmissable announcement for Ace Attorney fans is that the same games we've already played on four different platforms (possibly five, if you're a Japanese Game Boy Advance owner) will now be available on four more platforms. That's arguably fine (see later in this article for the argument it's not) for getting new fans into the franchise, but that does nothing for existing fans. Here are the problems with Ace Attorney no longer being a Nintendo-exclusive, so much as mobile appearances don't count as Nintendo-nonexclusive since Nintendo franchises themselves keep appearing in official capacity on mobile. 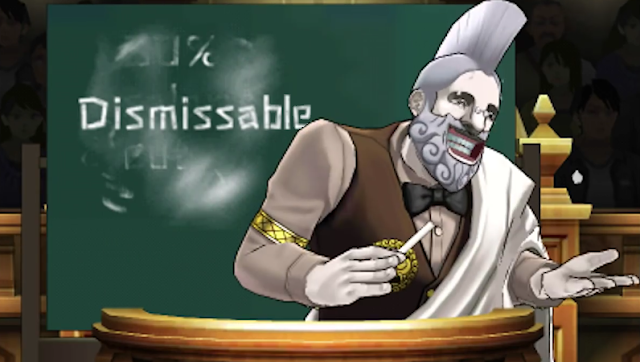 One of the reasons we gave for why Phoenix Wright should be in Super Smash Bros. is that he's a Nintendo loyalist, and that should count for something when looking at a third party to get in the game. Obviously... he's no longer going to be a Nintendo loyalist, though he still will by the time of Super Smash Bros. Ultimate's release date. The second problem is that this gives a big excuse for CAPCOM to try to catch up all the PlayStation and Xbox userbases to the other mainline Ace Attorney games, so we might have a second trilogy (or three individual releases as they've existed so far) of Apollo Justice: Ace Attorney, Phoenix Wright: Ace Attorney – Dual Destinies, and Phoenix Wright: Ace Attorney – Spirit of Justice. While that's not a bad thing at all, the problem here is that CAPCOM will spend a year doing that and making edits to the scripts and programming... instead of working on and localising the seventh, brand-new Ace Attorney game. We know, at least outside of Japan, CAPCOM can only work on one Ace Attorney at a time. Wouldn't it be a shame if they're doing catch-up for the sake of non-Nintendo platforms, to the detriment of a new game? We might not see one until 2021. The third problem? I don't think that there are many people who would be Ace Attorney fans on other gaming platforms, or have been begging for Ace Attorney to come to their non-Nintendo or non-mobile gaming platforms. Who wants to go play a visual novel game on their Xbox One? The dismal reception and impact of the WiiWare versions of the Ace Attorney games goes to show that playing them on home consoles is extremely unpopular. Remember, the Switch is both a home console and a handheld! Plus, it's not demographically a fit. Do adrenaline-junkie Xbox One fans like visual novels? The ill-fated PlayStation Vita has the niche player base that actually does appreciate visual novels, like Danganronpa. As far as I'm concerned, no news would be better than this news. ...Oh yeah, the panel also had some stuff about Season 2 of the Ace Attorney anime, but none of it was news. Looking forward to that next month! Ludwig still has some of the old-school console war mentality in him, which may explain some of his reactions to the news. Let him know if you agree with his opinions, or if you own a non-Nintendo system and haven't yet experienced Ace Attorney but now you will. New Ace Attorney fans are always appreciated. For an example from just this month, click here! Don't want to wait for 2019 to play Ace Attorney Trilogy? Good. You shouldn't. Mere weeks after this announcement, the 3DS game went on sale at 60% off! Specifically, 2019 means April 9. April 9 happened. Don't miss it. CAPCOM is attempting to beat Bethesda when it comes to porting their games on the most devices possible. I'm wondering when the Amazon Alexa edition will release. With Ace Attorney, an Amazon Alexa edition is actually quite possible! "Alexa, open the court record. Present the passport to the judge." "Are you sure you are ready to present? Yell 'Take That!' if you are or say 'No' if you want to present something else." "After presenting the passport to the judge, you explain that the victim's clock was not three hours behind but actually nine hours ahead because the victim had not reset her clock before she was murdered. The judge is amazed at your incredible deductive skills. The witness Mr. Sahwit is arrested and taken away into custody, and the defendant Larry Butz is given a 'Not Guilty' verdict. The court is then adjourned." Well, that's how adventure games were before the days of graphical user interfaces. Visual novels have been released on the PS4, so there must be an audience for console visual novels. PC and handhelds always feel like a better fit to me, though. Though I dunno how much PS4-ers enjoy it or prefer it or if they just lack other options. If it was just Switch, they'd announce AA7, or announce Trilogy, then AA7, and then another compilation. But now they almost have to announce another compilation after this one. Bowser Jr.'s Journey... to ARMS Scrub? What's Your Style? Retro vs. Modern Splatfest! Welcome Witch Princess to KoopaTV Staff!